A catacomb is an underground tunnel that is used to hold and bury dead bodies. Many of them were made in the Roman Empire. 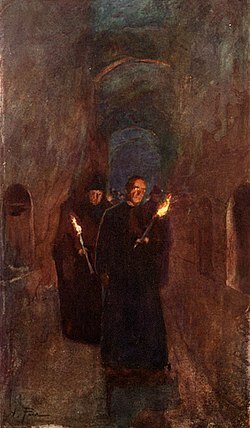 The Catacombs is the eighth movement from Pictures at an Exhibition by Modest Mussorgsky. It describes of loud and soft sounds of echoes in catacombs. This page was last changed on 18 March 2017, at 21:36.